The founding values of the PNC, setting out the historical and ideological background of the movement as well as its organisational principles. The PNC is the result of the fusion of two movements –which themselves were the results of prior reorganisations– representing a significant trend in Corsican nationalism: the UPC Scelta Nova and Mossa Naziunale. In the spirit of our forty years of modern nationalist struggle, our action is entirely oriented towards a single objective: securing the future of the Corsican nation through recognition of the political rights of the Corsican people in the new Europe. Fighting for a linguistic and cultural reconquest and human rights are at the centre of this commitment, which brings together the struggle for freedom and the free self-determination of peoples. This action advocates a particular political path, that of the accession of a responsible Corsican society founded on the historical and cultural values of our people, social justice, ecology and a rejection of xenophobia. The PNC is working towards the realization of a three-fold claim: - legal recognition of the Corsican People, European nation; - attainment of an increasing share of sovereignty in the framework of, and modelled upon, the European expansion; - official status for the Corsican language within its territory. Restoring confidence to Corsicans entails going beyond the single idea of claiming legislative power and sovereignty. It’s a question of being ready to take the next step and demonstrate to the Corsican people our sense of our responsibilities, our will and our ability to participate in the future government of Corsica, and to do so on the basis of a historical commitment. Thus, if circumstances permit or indeed oblige, we must be ready to lead, ready to build our country with other forces on a platform resolutely oriented towards the political emancipation of our people. That is the real qualitative leap we wish to make. Opening up to other nation states demands follow-up and real coordination. The PNC participates in the European Free Alliance (EFA), along with the Scottish National Party, the Parti Nationaliste Basque and Eusko Alkartasuna, Plaid Cymru, the Bloc Nacional Gallego, etc. Our membership was definitively ratified by the EFA’s General Assembly. We have also been ratified by Régions et Peuples Solidaires (Regions and Peoples with Solidarity - RPS). It would be advisable to intensify our international policies, chiefly because they will allow us to evade certain French-Francophone arguments and to gain credibility vis-à-vis public opinion. Eventually, the aim is for the Corsican nation to acquire direct representation in European political structures. Progressive and concerted achievement of a significant share of sovereignty, entailing genuine legislative powers, in keeping with the effective European principle of subsidiarity. Corsica is often an enigma from the “outside”. The media tend to focus only on two aspects: the beauty of the landscape and the occasional violence. In order to understand, one needs to take account of her history, a product of incessant conquests and constant struggles to defend her freedom. Corsica is a sought-after island at the heart of the Mediterranean. It has always been a geostrategic point for the great nations of Europe and the world which cross paths in Mare Nostrum. Today the tensions and battles are less to do with armed combat, and more to do with global finance and political lobbies. But the appetite of the powerful remains undiminished for this sparsely-populated isle, even if there has been a demographic upturn in recent years. Corsica only became French relatively recently. 1769 marked the end of a period of independence under Pasquale Paoli, a heroic figure, ahead of his time, recognised as such by all the progressive minds of the Age of Enlightenment. While much of Europe was ruled by absolute monarchies, he freed the island from the Genoan yoke in 1755, and gave it a democratic constitution whereby the people had a voice, instituted the separation of powers, and gave the right to vote to female heads of household... He founded a university (educating young people was one of his chief priorities), minted coins, and created a navy to defend the coastline. He also set up a rigorous justice system to restore order, nominated a national anthem (Dio vi Salvi Regina, adopted in 1730) and a flag (the head of a Moor, the emblem of various peoples at the time, set apart by the bandana on the forehead raised above the eyes, as a symbol of the Corsican people breaking free from their chains). In 14 years, his reputation spread throughout Europe, to the extent of inspiring Jean-Jacques Rousseau and the American revolutionaries! The French state will never consider Corsica to be an integral part of its territory, but as a colony of the French Republic. No real development was carried out apart from during the reign of Napoleon III, who built the road network (which didn’t change until the 2000s. It took the “Matignon process” and the eventual boost from the “Plan Exceptionnel d’Investissements” (Extraordinary Investment Programme) before we saw any improvements!). - From 1818 to 1920, customs laws taxed any Corsican product and refunded taxes on any product arriving from France. In a century, the meagre economy of the island was ruined. Thus Corsica was deliberately maintained in a state of submission which favours the clans (local powers under orders from Paris).With the clans, electoral fraud was rife and principles fell by the wayside. The state closed its eyes to these transgressions. - The two world wars were a veritable massacre for the Corsican people, who made an exception al contribution to military mobilisation. France called up many fathers and the Corsicans were systematically sent to the Front, with Senegalese infantrymen. After the first world war, (30,000 dead) there were only women and the infirm left to restart the moribund economy! Monuments to the dead serve as testimony to this. The Corsicans also paid a heavy price in the colonial wars (Indochina, Algeria, Chad). But Corsica has never been recognised for this. - Following the independence of Algeria, the Republic repatriated pieds-noirs in the South of the country, especially in Corsica. They were offered land and the means to make something of themselves, something that had never been granted to the Corsicans. This situation only increased feelings of injustice. The clan clamped down. The pieds-noirs used and abused their privileges, many supplemented their grape-growing income through financial and agricultural scams (added sugar and fraudulent cheques). The regionalists denounced the wholesale abuses of power, but the government was not interested. On August 22nd 1975, a dozen men took over the winery of a pied-noir who had been implicated in cheap wine scandals. They intended to give a press conference and, so as not to be immediately expelled by the police, they armed themselves with hunting rifles… The government, (prime minister Jacques Chirac, interior minister Michel Poniatowski) took totally disproportionate military measures. The authorities (hundreds of gardes mobiles) surrounded the winery, while army helicopters roared overhead and armoured cars invaded Bastia… They laid siege to the winery. There was one death (a garde mobile) and one serious injury (a militant in the winery). The inquiry revealed later that the garde was killed by his own side. The surrounding vineyards were overrun with police… And thus Edmond Simeoni, head of the nationalist organisation, escaped the death penalty and was never in the end convicted for anything more than “public disorder”. During the emotional night following the events in Aleria, Bastia saw two more deaths and dozens of injuries. “Nothing will ever be the same”, onlookers would observe to themselves. A few months later, in May 1976, The Corsican National Liberation Front (the underground FLNC) was created, and Corsican nationalism began looking in new directions. It divided into two main families. One was seeking autonomy, and rejected any violence. The other was fighting for independence, and supported the underground violence. The 80s and 90s saw tumultuous evolutions in the national movement. There were alliances and break-ups, fallouts between “autonomists” and “independencists”; all were trying to step out of the shadow of previous electoral victories and defeats. Cycles of attacks and repression punctuated these 40 years in the lives of the Corsican people, interspersed with militant cease-fires. Disagreements over this type of battle led to the disbanding of the militant branch and its legal front into several organisations, based also on regular provocation from the authorities (secret policing attacks in the 1980s under leader Riolacci; repression under prefect Brossard in 1984; prefect Bonnet in 2002 and the beach restaurants) etc. At regular intervals, faced with nationalist attacks, the state tried to bring in political solutions that were always insufficient, but nonetheless significant: reopening the university in 1981; the beginnings of recognition of Corsican language and culture; passing of various specific statutes (2002, 1991, 2003). At the beginning of the 1990s, contradictions and divisions at the heart of the militant front heralded a very tough period for nationalism. In 1994 and 1995, these divisions led to a bloody confrontation at the core of the different underground organisations which resulted in some twenty deaths. This period shocked the Corsicans to the core. The divide was enormous between those seeking autonomy and those seeking independence. But, even if the autonomists did not take an active part in the fratricidal clash, the entire nationalist family was discredited. And so a group of nationalists tried to take things in hand. They claimed the state, the clans, but also all the nationalist parties were responsible for the transgressions and wanted to create an “electroshock”. This is how they justified their mad action: the assassination on February 6th 1998 of the Corsican Prefect, Claude Erignac. There followed an all-out crackdown. Once again, the state responded badly. Beyond the death of a man, they could not allow the affront to the French Republic. The Corsican people were examined with a fine-toothed comb: 340 arrests were made, that’s one per village (proportionally, that would work out as more than 50,000 in France as a whole), with preventative detention for dozens of innocents. The embattled investigators inflicted ever-increasing injustices and abuses, according to hypothetical “leads” (the agriculture lead, the intellectual lead), they even went so far as to fabricate evidence or cover up vital elements! During this time, Parisian columnists spouted vitriol and belittled a people who they referred to “prefecticidal”. A commando group of several men was arrested. Dozens of years in prison were doled out , with three given life sentences (Pierre Alessandri, who was accused of being the killer, Alain Ferrandi and Yvan Colonna, who always protested his innocence, but was suspected of being the gunman). Two other men, accused of being the “brains” of the operation were also condemned to 30 years imprisonment (Vincent Andriuzzi and Jean Castela). They always claimed they were innocent. Fortunately for them their lawyers managed to prove a miscarriage of justice (verbal evidence falsified by a crooked policeman) and they were cleared on appeal. The appeal hearing for Yvan Colonna (in 2008) also revealed all the transgressions and abuses of this exceptionally vengeful “justice” which was offering unfair trials without hearing material evidence or witness statements which could have cleared the defendants. And in spite of the lack of evidence and the doubts cast in public opinion as to his guilt, he was once more condemned to 22 years. However, the arbitrary manner in which the case was tried, condemned by a report from the International Court of Human Rights, led him to the court of appeal and a third trial in 2011. This one also, contrary to expectations, condemned Yvan Colonna once again to life imprisonment, without parole. Which is illustrative of the lack of conviction among our judges. Yvan Colonna has appealed to the higher court for a second time. The day after Erignac’s death, prefect Bonnet was named as his successor. He would be arrested and convicted two years later for committing acts of secret policing which nearly led to another Corsican-against-Corsican conflict. (He had sent gendarmes to set fire to a beach restaurant, leaving compromising pamphlets at the scene. During one of these criminal fires, the gendarmes were injured and abandoned their materials on site. That’s how the conspiracy was uncovered). On July 6th 2003, Corsica’s status was subject to a new evolution through the “Matignon 2 process”, taken up by Nicolas Sarkozy, then minister for the interior (Matignon 1 had been initiated by Lionel Jospin). By about 1000 votes, the referendum failed, because three days earlier Nicolas Sarkozy had ordered the arrest of Yvan Colonna, who had been on the run, having escaped the wrath of the state. The night of his arrest, the minister for the interior (just as his predecessor Jean Pierre Chevènement had done, along with a prosecutor for the Republic) openly scorned the presumption of innocence. The Corsicans were outraged. The nationalist movement tried to rebuild itself, but, to quote Nicolas Sarkozy, who has since become president of the Republic, they “are not at the centre of the political game”. The democratic movement, through the creation of the PNC (Partitu di a Nazione Corsa, in the tradition of the historical autonomist movement) in 2002, advocated the “aggiornamento” of the whole nationalist movement. But it was not followed. So it brought about a reshuffling of the democratic movement and attempted a new union with the independence movement. 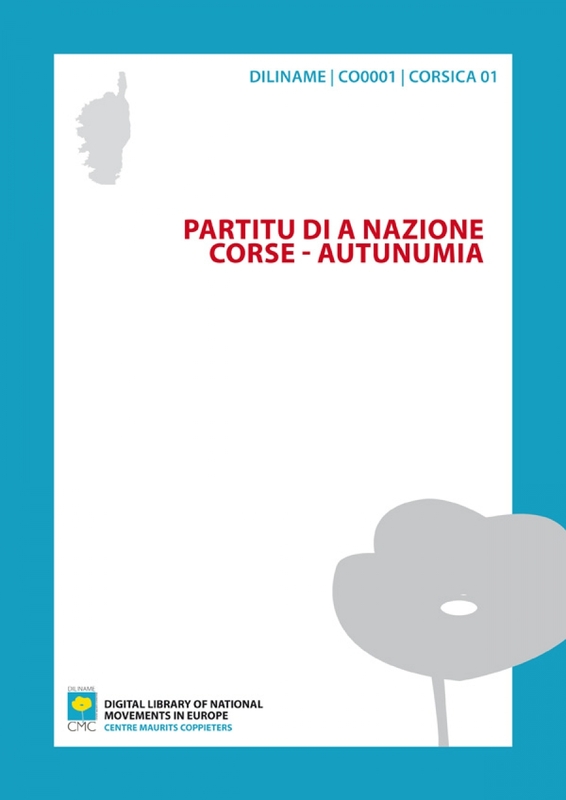 The “Unione Naziunale” was created for the territorial elections of March 2004 (Corsican Assembly). But, although they hoped to get into power based on this union, the nationalists only received 17% of the vote and 8 elected members. It was a step forward in comparison to the black period from which the movement was emerging. But not enough. The supporters of the independence movement were disappointed. Even more so given that the government continued to pursue its policy of police repression. Underground violence started up again. The democratic movement tried pull up the whole nationalist movement and appeal to a “negotiated political solution”. But in order for that to work, all the parties present had to be in agreement. However, both the state and the independence movement refused to enter into talks. Bastia and Portivechju are symbols, they are both clan fiefdoms (one on the left, one on the right). The teams working for the moderate movement have been rejuvenated, the discourse is dynamic and promising, the PNC, the principal force at the heart of moderate nationalism, is making significant progress on the structural level. In parallel, it is energetically pursuing an international strategy. One of its spokespersons, François Alfonsi, is an MEP for the Europe Ecologie coalition (the PNC has had strong links with French environmentalists for a number of years). In Corsica, the coalition got the best result in France, with 24% of the vote. But the major breakthrough came in March 2010, with the unification of the moderate family, by means of a process dubbed “Femu a Corsica”. 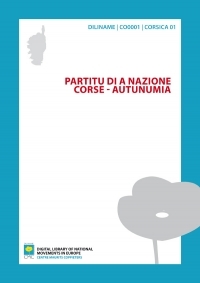 The PNC takes an active part in it, with two other members of the moderate movement: Edmond Simeoni’s A Chjama Naziunale and Gilles Simeoni’s Inseme pè a Corsica. Here the strategy of separation achieved one of the most wonderful results in the history of modern nationalism: with 37,000 votes, 26% of the electorate and 11 representatives, Femu a Corsica has now positioned itself “at the centre of the political game”. Even more so given that the right is falling apart, while on the left, the various divided coalitions need to unite in order to present a serious threat to the nationalists’ rising star. In parallel, after a quiet period from 2007 to 2009, the independence movement is also building a coherent front; through a single party named “Corsica Lìbera”, they also got a strong result, 10% and 4 representatives. Today, the combined forces of nationalism represent 36% of the vote. That is a force to be reckoned with. We are on the threshold of an historic sea change. 52,000 people, a third of the island’s electorate, in this March 2010 election supported the fundamentals of nationalist ideology: protection of our heritage and environment, recognition and development of our identity, particularly in terms of language and culture, the search for a negotiated political solution to allow the release of political prisoners and the establishment of peace. Never has such a strong message been sent to Paris! And all of this based on the endorsement of the outgoing team, but also the clans, both on the left and on the right. Unfortunately this message has not been taken in on the part of the traditional powers in the Corsican Assembly who, despite a relative majority, have made no overtures to the nationalists. Both Femu a Corsica and Corsica Lìbera remain, therefore, for the time being, in opposition. The historic breakthrough of the Femu a Corsica coalition represents a turning point in the history of Corsican nationalism. Femu a Corsica intends to give structure to this alternative and build new momentum in time for the next ballot. The canton elections in March 2011 saw another great leap forward for the PNC. Its national secretary, Jean Christophe Angelini was elected as councillor, a post which has traditionally been very difficult for Corsican nationalism, since the power has rested firmly with the clans. Even better, Jean Christophe Angelini beat the leader of Sarkozy’s right, Camille de Rocca Serra, putting an end to over 20 years of power sharing with the clan in the far south. Which bodes well for the next ballots, (legislative elections 2012, municipal and territorial elections 2014). For the time being, the objective for the moderate movement is to assess our current situation, work hard for the Corsican Assembly, but also on the frontlines of the Corsican people, in order to build this alternative and break away from the practices of the past, by bringing together all our current strengths, and by opening a strong, political perspective that can lead to development, hope and peace for the Corsican people. Autonomy for the PNC is the achievement of the five powers which the other Mediterranean islands and most of the major regions of Europe already enjoy. It’s not a question of being the “French exception”, but rather the “European norm”! Legislative and regulatory power first and foremost, widely debated in its time during the Matignon process for obvious reasons. Fiscal power, for Corsica needs a more dynamic position, genuinely oriented towards production and the recognition of specificity. Administrative power, for no territory in the world can move towards emancipation and development with such a labyrinth of different levels of competence, such a stacking up and dilution of public policies and resources. Finally, financial power, because we do not exist in a bubble, sheltered from the jolts and jerks of a global crisis. The strain on the public finances is significant and long-term. To minimise the effects of this, we need to free up new resources, create pathways which common law might prevent us from following. Which is why we want latitude and freedom. The nationalism Corsica needs is constructive, sharing and open nationalism, and we want to embody that. Corsican nationalism needs a new, clear theoretical basis, because the situation has evolved considerably in the last thirty years. But more than theories, even if they are up-to-date, what we need is renewed action and projects, experiences and pathways. Hence the sharing and the openness, for our national movement, in the diversity of its convictions, must renounce the “day of reckoning” and the “spontaneous generation” that wanted to stand alone, slaying giants. We need to share our hope in order to bring it to fruition, and stop thinking that we must struggle alone. We are at the dawn of important, defining advances for the future of our country. We must start preparing today for the autonomy of Corsica in the European framework. We must cling on to that because it is an vital need for our people, and we must also be ready to put it into action along with others.